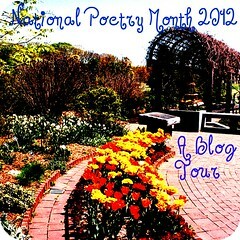 Welcome to the 2012 National Poetry Month Blog Tour. This will be a sticky post through the end of the month of April, so please scroll further down for today’s post. If you’ve decided to hop on the blog tour, please grab the button above and link back to the tour. Here’s the current schedule for the tour. 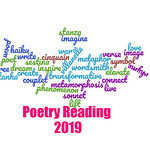 Please place your full post links in the Mr. Linky below so that others can celebrate poetry with you and Billy Collins. Also, if you’re interested in trying a book of poetry, leave a comment and you’ll be entered to win one copy from a donated stash of poetry from poets and publishers. Don’t forget to add your permalink. This giveaway is a wonderful treasure. many thanks. This is a wonderful aid, reference & collection of poetry in its many forms. Your promotion of poetry is appreciated! I have to admit the science and math in the poetry book do spook me. Thanks for telling these subjects exist in the poems in a gentle way. I love the title. This author has been through a great deal. So happy her trip to Africa gave her back the will to live. Would love to read these poems. Thanks for posting one. My post about litany poems is up! I don’t read a lot of poetry books and I’m not sure why … so I’d be happy to enter the giveaway to for a chance to try one. The idea of a poetry blog tour is a great way for people to get to know each other’s work and thoughts about poetry and writing and what inspires them. Thank you for doing this. Would love to win one of the books of poetry. Link is correct but the title is wrong. The little girl pushed send before I was finished. Excited for the tour! April surprised me this year so I wasn’t quite ready for it. Glad I have great places like SavvyVerseAndWit to help me along. I’ve posted my link, but in the first one, I accidentally didn’t delete the autofill material from the last time I used Mr. Linky. They both lead to the proper post, but if you can delete the miscue, that would be great. Happy Poetry Month! Happy National Poetry Month! Looking forward to seeing the tour. Thanks for hosting again. The Girl and I are happy to participate! Thanks for stopping by and continuing to promote poetry too. Thanks for joining the band!